Background Each year, over 600 interns participate in the WHO-HQ internship programme in Geneva, Switzerland. These internships are part of WHO’s commitment to build future leaders in public health. However, in 2013 only 20% of interns were from low- and middle- income countries (LMICs), which have 80% of the world’s population and disease burden. The Network of WHO Intern Alumni, in partnership with Child Family Health International, are administering a scholarship opportunity to financially support two candidates from an LMIC and cover the costs of an internship at WHO Headquarters Geneva in the Winter 2015/16 cycle. This forms part of a wider project to support more balanced multinational participation amongst junior candidates in international health training, and build an evidence base on their impact and utility for national health systems. The availability of temporary contraceptives for family planning has led to decline of males and females going for permanent services of vasectomy and minilaparotomy. 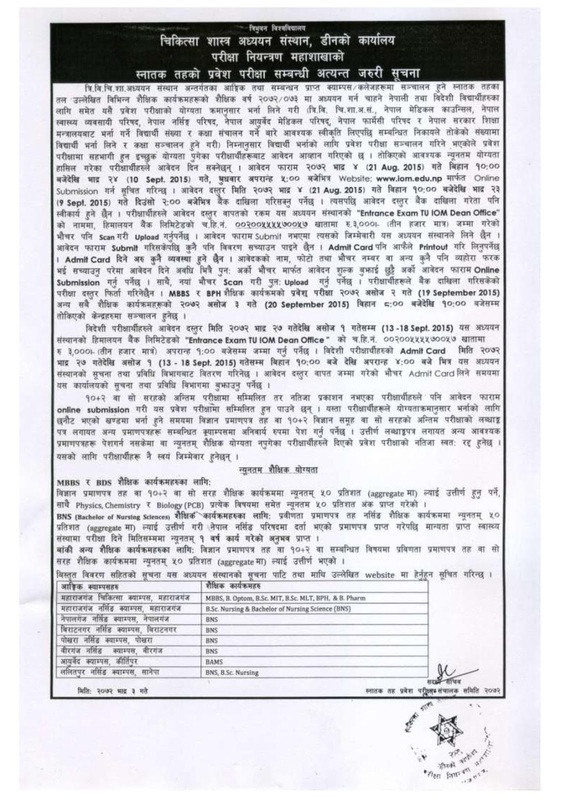 Data at the District Health Office Kavre showed that both males and females were attracted towards temporary contraceptives due to their easy availability in Kavre bazaar and elsewhere. Family planning officer Ananta Sharma at the Kavre district health Office said that easy access of intraurine contraceptive device ( IUCD) and implant had slashed the number of males and females seeking vasectomy and minilaparotomy services. According to Sharma, as many as 165 males and 90 females had taken the services of vasectomy and minilap last year. Similarly, 528 females had taken IUCD, 2,995 females implant, 3,549 dipo, and 1,332 women had taken the pills respectively. Chevening Scholarships in Nepal are awarded to outstanding emerging leaders to pursue a one-year Master’s at any UK university. The scholarship programme provides a unique opportunity for future leaders, influencers, and decision-makers from all over the world to develop professionally and academically, network extensively, experience UK culture, and build lasting positive relationships with the UK. A Chevening Scholarship offers financial support along with the opportunity to become part of the highly regarded and influential Chevening global network. A sub-committee formed to study, analyse, and discuss with stakeholders about implementation of a report on medical education, prepared by Kedar Bhakta Mathema-led high-level task force, has formulated and submitted its detailed action plan to the Social Committee of the Cabinet. A computer-based Acute Rheumatic Fever (ARF) diagnosis and management decision support system has been designed and developed in Lalitpur.According to Nepal Heart Foundation, the system is the first of its kind in the country. It is a collaboration project between NHF and University of Greenwich, UK. The project comprises of a team including Sanjib Raj Pandey, PhD research student, University of Greenwich, UK; Dr Jixin Ma, Prof Choi-Hong Lai, University of Greenwich, UK; Dr Prakash Raj Regmi and other doctors from NHF. Dr Regmi informed that untreated streptococcal throat infection which is common among Nepali children causes ARF. ARF and Rheumatic Heart Diseases (RHD) are considered some of the biggest health risks among Nepali children, in comparison to other heart diseases. “ARF/RHD is a challenging and life threatening disease among children aged between 5-15 years, especially in the rural areas of the country. Medical waste dumped along with other garbage has posed serious public health threats to people living on the banks of the Tinau river in Rupandehi. Butwal Sub-metropolis dis-poses around 50 tonnes of gar-bage on the river banks though people continue to use water from the river for drink-ing and other domestic use. 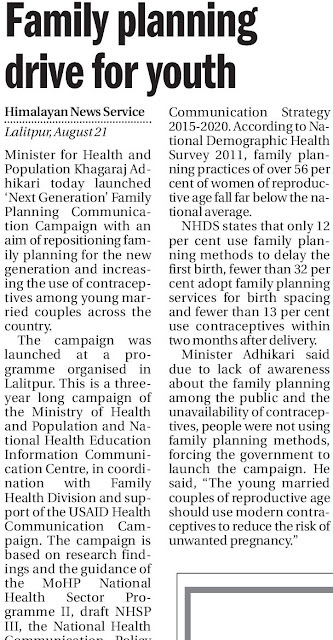 Lalitpur, August 21 Minister for Health and Population Khagaraj Adhikari today launched ‘Next Generation’ Family Planning Communication Campaign with an aim of repositioning family planning for the new generation and increasing the use of contraceptives among young married couples across the country.The campaign was launched at a programme organised in Lalitpur. This is a three-year long campaign of the Ministry of Health and Population and National Health Education Information Communication Centre, in coordination with Family Health Division and support of the USAID Health Communication Campaign.